Hike the sacred Inca Trail to UNESCO-listed Machu Picchu, take the opportunity to spend the night in an Andean homestay and explore historical cities on this Peru tour. You'll begin the trip in Lima and continue onto Cusco, the gateway to the Sacred Valley and Machu Picchu. After spending the night in a traditional village, you’ll embark upon the four-day Inca Trail to iconic Machu Picchu. 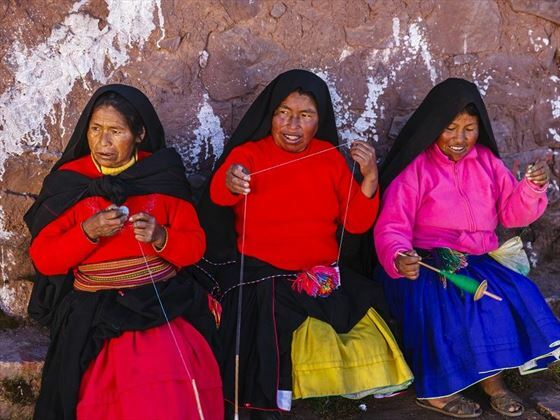 Highlights include camping in the Sacred Valley and getting to know locals at a Chinchero homestay. You’ll also have the chance to tour both Cusco and Lima, cities filled with Spanish, Incan and Andean architecture. 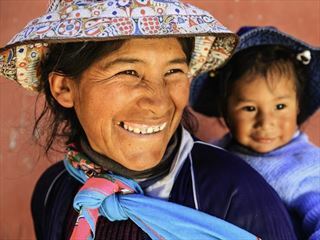 This trip is perfect for active families with teenagers and includes a cycling trip, hiking, camping and a slice of real Peruvian culture (INT - GGFA). 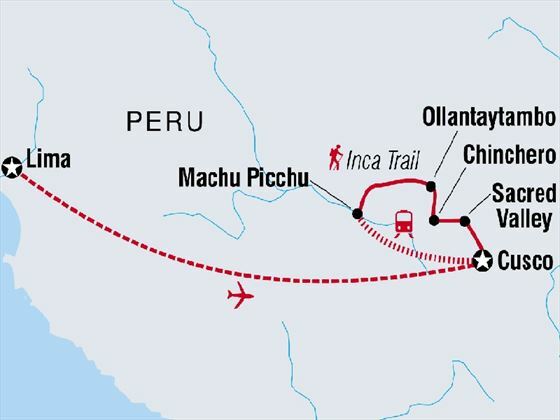 Walk the famous Inca Trail, the original route to Machu Picchu. Spend the night at a homestay in Chinchero, an authentic Andean village. 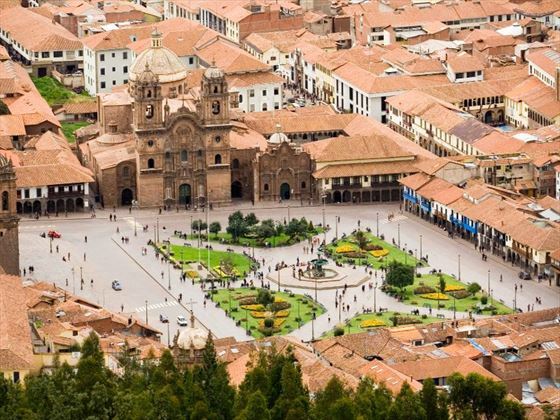 Relax in Cusco and wander the city’s ancient cobbled streets. 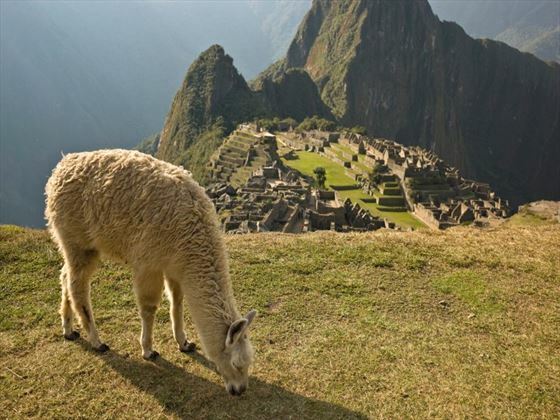 Take a guided tour of Machu Picchu, one of the New Seven Wonders of the World. Visit Lima’s cathedrals, markets and monasteries. Cycle in the Sacred Valley, taking in mountain views and visiting Incan ruins. Please note the minimum age for this tour is 10 years old. Your trip begins in Peru’s capital, Lima, with a transfer to your hotel and welcome meeting. If you arrive early, head out to see the city and its historical buildings, including Spanish colonial cathedrals, markets and leafy parks. Don’t forget to taste some of the city’s seafood, including ceviche. Today you’ll delve into Lima’s history with a guided tour. Visit the cathedral and National Museum of Archaeology, Anthropology and History to see pre-Incan textiles, relics and tools. The tour will also take in the Baroque, 17th century San Francisco Monastery and its underground catacombs, which hold the remains of up to 70,000 people. In the afternoon, you’ll fly to Cusco. Cusco sits at 3,450 metres above sea level, so take it easy today and stay hydrated to acclimatise. Take a guided half-day tour of the city, which is the oldest in Peru and filled with Incan, Andean and Spanish architecture. Visit churches, pretty squares, the Coricancha Temple and Cusco Cathedral. You’ll also get a Full Boleto Turistico Pass, which provides entrance to 16 historic sites in and around the city. Enjoy a free day exploring Cusco independently. Make use of your tourist pass to check out the main sights. Top picks include the Museum of Inca Culture, as well as San Pedro Market. Head out of the city for optional adventure activities in the nearby area, including zip-lining, biking and stand-up paddle boarding. Located in the Andean highlands, the Sacred Valley was the centre of the Inca Empire and is dotted with old towns and ruins. Head into the 60-kilometre valley taking in views of the mountains and farmland, to the village of Pisac. 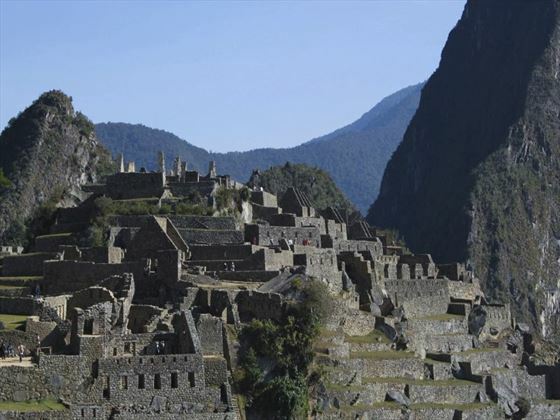 Browse the market and visit nearby Inca ruins which sit on a hillside overlooking the valley. Tonight, you’ll stay in a quiet farming village. Start the day with a four-hour trek up to the village of Chinchero, passing along an Incan road in the Urquillos Valley. The village sits at 3,760 metres above sea level and offers views of the Vilcanota mountain range. Watch the villagers weaving and working in the fields, then visit the market for a taste of local life. You’ll get to see the beautiful church and nearby Inca ruins, as well as spend the night in an Andean family home. After breakfast, a private minibus will take you to Moray, an important Inca archaeological site that used to be an experimental agricultural area. This is where your cycling trip begins to the Maras Salt Flats, a journey of around 35 kilometres. You’ll be given bikes, helmets, gloves, knee and elbow pads and there will be snack breaks along the way. A support vehicle will follow if you don’t want to cycle the whole way. Explore the striking salt pans, which feature geometric salt pools before continuing downhill to Pichingoto. From here, you’ll take a minibus to Ollantaytambo, which has its own ruins set on a hillside and grid-like Incan streets. Enjoy the views over the valley from the Ollantaytambo archeological site after breakfast. 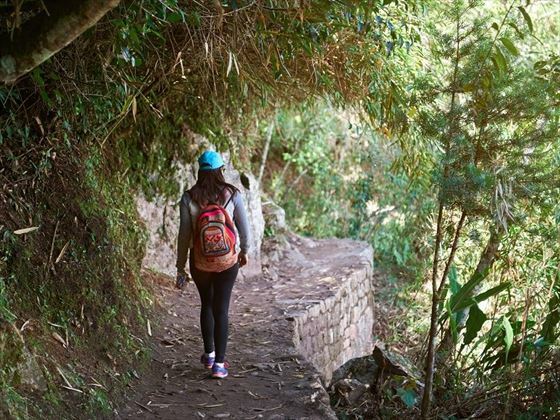 Next, you’ll be transported to the 82-kilometre mark to start your classic Inca Trail hike. Trek along the original path used by the Incas with your team of porters, cooks and guide. The day starts with an uphill climb, passing archeological sites Huillca, Raccay and Llactapata, with views of the Veronica Peak along the way. Your campsite is set at 3,100 metres above sea level and will be put up by a team of porters, who will carry the gear and cook your meals. Note that you’ll leave most of your luggage in Ollantaytambo, packing a five-kilogram duffle bag for the trek. You’ll be provided with foam sleeping mats and can rent sleeping bags. There will be a toilet tent provided. Today you’ll face the most challenging part of the trek. In the morning you’ll hike through the valley to Wayllabamba, the last place on the Inca Trail that was inhabited and have lunch near the summit. In the afternoon, you’ll move up a steep trail to the highest point of the trek, Warmiwanusca, also known as Dead Woman’s Pass. Take in the views from 4,200 metres before you descend into the valley and your campsite for the night at Pacaymayo. Continue descending today, through the Runkuracay Pass and out of the cloud forest. You’ll cross the Aobamba River beneath the Sayacmarca ruins to your campsite, which is perched just above Phuyupatamarca. 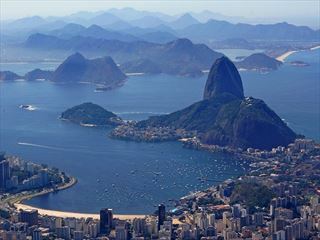 Take in views of the mountains, stretching all the way to the Amazon Jungle, which is located nearby. Today you’ll rise early and head downhill for two-and-a-half hours to Winay Huayna where you’ll stop for lunch. It’s just a two-hour walk to the final stop: Machu Picchu. Take in your first panoramic views of this lost Incan city, which dates back to 1440 AD, before you take a bus to Aguas Calientes. Check into your hotel, have a well-deserved hot shower and rest up for the tour to Machu Picchu the next day. Head out early for the 5.30am bus to Machu Picchu for a two-hour guided tour of these legendary Incan ruins. It’s thought the site was once used as a retreat for Incan nobles and you can explore the remains of its living quarters, palaces and temples. There will be time to wander independently and get photos from the best vantage point, the guard tower, before heading back to Cusco via train and bus. Enjoy a free day in Cusco to relax after your trek. Treat yourself to a massage, try some delicious Andean cuisine at a local restaurant or do some shopping for souvenirs. You can also stroll the cobbled streets, popping into churches and cathedrals, or simply chill-out in a café on the main plaza. Your Peruvian adventure comes to an end and there are no activities planned for the day. Depart the accommodation whenever you like, fitting in some final sightseeing if you have time. Accommodation: eight nights in a hotel, three nights camping (basic facilities) and one night in a homestay. Transport: internal flights, train, minibus. Small group guided tour with 2-16 travellers. Food: 13 breakfasts, five lunches and four dinners. 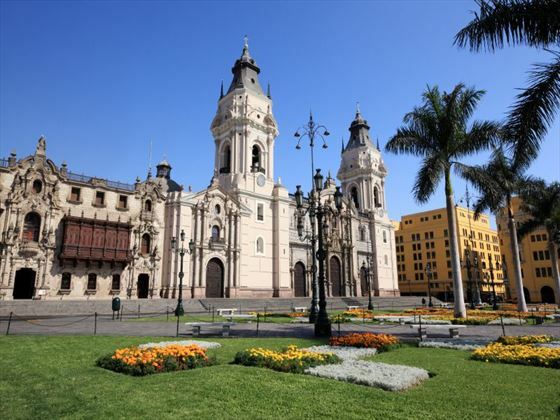 Activities: Lima Archeological Museum, cathedral visit and guided tour of the San Francisco Monastery and catacombs. Cusco coca tea, Coricancha Temple and Cusco Cathedral entrance fee. Cusco Full Boleto Turistico Pass with entrance to 16 sites in and around Cusco, transport not included. Machu Picchu guided tour. 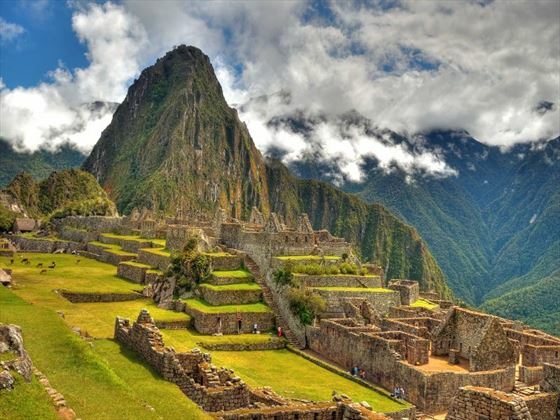 The Inca Trail permits need to be booked far in advance - if these are unavailable at the time of booking, you can opt to hike the also wonderful Inca Moonstone Trek. 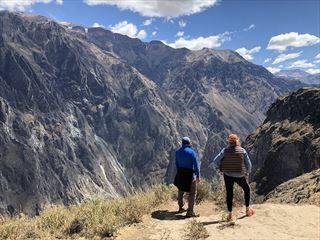 The Inca Trail closes in February to allow cleaning and restoration works - if the trek part of your tour falls during this month you'll automatically be booked onto the Inca Moonstone Trek. Some of the Inca Trail is tough, especially at those high altitudes - you'll have an experienced crew with you throughout and will be in good hands. It can get cold in the Andes! Make sure to bring some warm clothes to cover all bases.